Joel Friedlander is an author, an award-winning book designer, a blogger and the creator of programs that train authors to achieve the impact their work deserves. Joel is available for keynote speeches, panels, subject-matter workshops, webinars, and half-day and full-day seminars. What if you didn’t have to spend a year or so writing a book that, when it’s published, may or may not achieve the impact you want. What if I could show your nonfiction authors how they can monetize their book before they write it and get powerful marketing feedback at the same time? This presentation will walk through this new way of creating a book for publication. Your cover is the most important tool for marketing your book, and it has several important jobs to do. In this lively presentation we’ll look at covers that succeed–and ones that fail. You’ll learn to recognize the 4 common problems that doom many self-published book covers, and 3 simple conceptual tools that will help you get a book cover that works. Real-world samples and critiques anchor this presentation, so you can get real results. How authors will be publishing their print and ebooks in the new age of self-publishing. 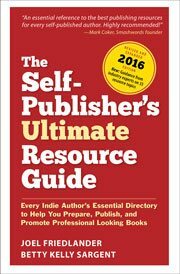 How to harness the remarkable benefits of being a published author. Clarifying your publishing goals and navigating the sometimes murky waters of the self-publishing world to find the right path for you and your book. Building a fan base, spreading your ideas, increasing your authority and making the contacts you’ve always dreamed of. The center of your nonstop, content-driven traffic and engagement system. How to use your expertise to build a valuable online asset and turn your content into an amazing variety of multimedia products using the latest technology to reach the readers just waiting to find your message. “Joel Friedlander packed the house during his presentation at the 2016 Redwood Writers Conference. And he did not disappoint. Rave reviews.” — Robbi Bryant, President of Redwood Writers. SAN FRANCISCO, CALIFORNIA: Publishing Professionals Network – Emerging and Evolving Careers in Publishing. “There was never any doubt, so it’s with pleasure but no surprise that things went very smoothly, thanks to both Joel and Sharon. As always, the information was clear, stated well, the energy was kept constant, and if anyone ever doubted this, now they know for sure that Joel knows everything and he is completely generous with the transmittal of this knowledge. business. But Joel kept things positive, possible, and the presentation was the clearest I’ve heard about much of this content. Please use the Contact Form to get in touch, thanks!